Handsome, sturdy and useful, Gullah sweet grass baskets are a unique American craft, one that has survived in an age when so many household furnishings and decorative objects are products of Asian factories. (The Gullah people are African-Americans living on the coast of South Carolina and the nearby barrier islands who developed a distinctive Creole language.) Like many great handicrafts, these baskets tell a fascinating story, as well as offering a high level of artistry and design. They are the very best souvenir you can bring home from a trip to Charleston. With more than 50 resident Gullah artisans, the Charleston City Market is one of the great centers of sweet grass basketry. 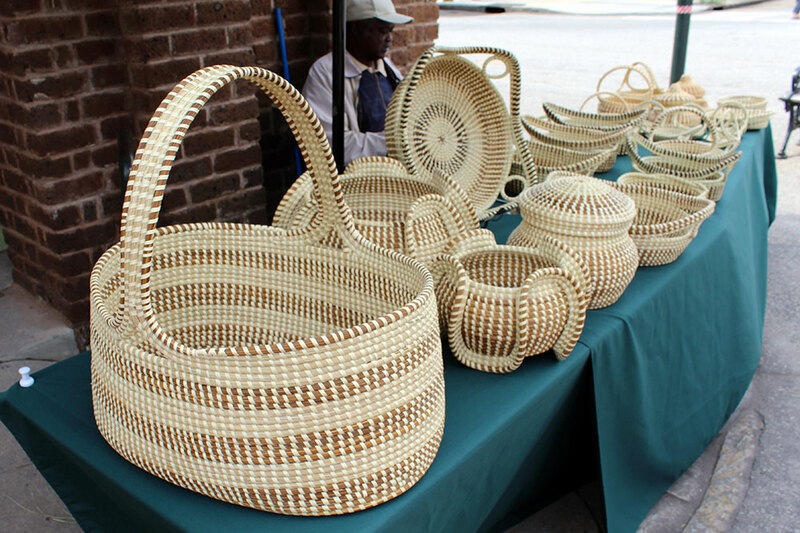 With more than 50 resident Gullah artisans, the Charleston City Market is one of the great centers of sweet grass basketry. The basket-weaving tradition was brought to the Lowcountry by African slaves in the 18th century. Production of the baskets began for utilitarian reasons, since the large fanner baskets made by slaves were originally used to winnow rice from its chaff on the rice plantations. Through the years, the basket weavers started making functional baskets for home use, a trend that accelerated after the Civil War and Emancipation, when basket weaving became an important source of income for some recently freed slaves. The tightly braided and coiled baskets are made using locally harvested bulrush, a strong yet supple marsh grass that thrives in the sandy soil of the Lowcountry, and also sweet grass, pine needles and palmetto palm. Their visual designs are simple and geometric, with color schemes created by the natural shades of the materials. Perhaps the most famous living sweet grass basket weaver is Mary Jackson, who learned to weave when she was 4 years old. Her intricately detailed and often sculpturally shaped baskets are part of the Smithsonian American Art Museum’s permanent collection, and her work has been purchased by everyone from Prince Charles to the Emperor of Japan. She started selling her baskets in the Charleston City Market in 1980. Her devotion to the centuries-old craft was recognized in 2008 when the MacArthur Foundation awarded her a $500,000 fellowship (often referred to as the “genius grant”). Now in her 70s, Mary works on private commissions out of her personal studio. In addition to the Charleston City Market, the other local sweet grass basket center is the Sweetgrass Pavilion in Mount Pleasant, just over the Arthur Ravenel Jr. Bridge heading east out of Charleston.